Are you looking at putting an offer in on a Residential Property in Queensland or maybe you have just signed a Contract? Here are 5 things you need to know when purchasing a Property in Queensland. Speak to a Property LawyerAs the saying goes, buying a home is one of the biggest investments you are likely to make in your lifetime. 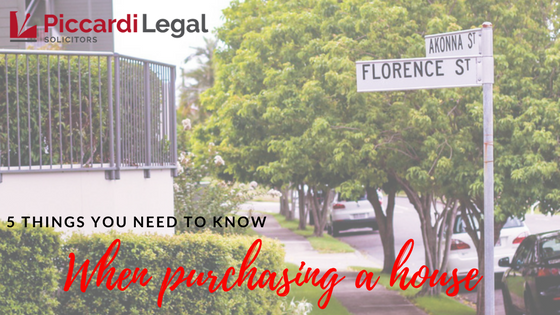 In Queensland particularly it can be a case of Buyer Beware and for this reason it is important that you know your rights and obligations under the Contract. An experienced Property Lawyer can guide you through the process and also provide you with pre-contract advice including the drafting any special conditions you may require to ensure a smooth and enjoyable transaction without surprises. Arrange InsuranceThe Contract states that the property is at your risk from 5:00 pm the day following the Contract Date. For residential property we recommend that you arrange insurance that covers the dwelling, contents & public liability. For Lots in a Community Title Scheme the Body Corporate is responsible for insuring the building for replacement value and public liability for the common property & any relevant body corporate assets. We also recommend arranging insurance for the contents (which includes carpets, curtains etc) and public liability for the Unit/Town House’s interior. If you are obtaining Finance Approval, forward a copy of the Contract to your Lender together with any other documents your Lender may require and ask that they finalise and submit your finance application. Once you have received the unconditional finance approval letter you should review and forward this to your lawyer. If the terms of the approval are satisfactory to you and your Lender will have sufficient time to prepare for Settlement then you should instruct your Solicitor to notify the Seller or their Solicitor by 5:00 pm on the due date for Finance Approval that the Finance Condition has been satisfied. If you are unable to obtain unconditional finance approval on satisfactory terms by the due date then you may either request an extension or terminate the Contract. There is no obligation on the Seller to grant the extension and if the Contract is terminated at this stage then you will be entitled to the deposit back provided you are acting reasonably.If your Contract is subject to a satisfactory Building & Pest Inspection you should arrange for an inspection to be carried out by a qualified and licensed building and/or pest inspector. Once you have received the Report(s) you should let your Lawyer know if they are satisfactory or not. If you are not satisfied with the Report(s) you can instruct your Lawyer to terminate the Contract. In order to terminate the Contract lawfully you must be acting reasonably i.e. there must be major defects listed in the Report. Major defects may include structural damage or active termites in the dwelling. Major defects do not include the risk of future damage or future termite attack. You should advise your Lawyer what issues are not satisfactory to you in the Report(s) so that you your Lawyer can advise on your rights. In some instances a Seller may agree to attend to a number of repairs or be prepared to offer a price reduction in exchange for you waiving the Building and Pest Inspection condition. If you decide to terminate then the Seller is entitled to a copy of the Report which must be provided without delay.Notwithstanding the above, your only right under the Building & Pest Inspection clause is to terminate the Contract provided you are acting reasonably. Contractually you do not have a right to reduce the Purchase Price or require the Seller to carry out works however in some circumstances the Seller will agree to reduce the price or carry out certain works. If a price reduction is negotiated then this may affect an existing finance approval or prompt your financier to require a further valuation. This should be checked before confirming that the Finance Condition has been satisfied. At the commencement of your matter you should also advise your Lawyer if you have any particular concerns in relation to the property (for example, whether the relevant building approvals have been obtained) as an additional search may be required. We strongly recommend that these searches be ordered as soon as possible as once the Contract is unconditional you may not be able to terminate if you are not satisfied with the search results e.g. if a Final Certificate has not issued for the dwelling or an extension. Once your finance application has been approved you will need to sign and return your Loan Documents as soon as possible to ensure that your Lender is prepared in time for settlement. Some Lenders can require up to 3 business days notice for a settlement booking and they will usually not take a booking until they have received and reviewed your executed loan documents. Some Lenders can take a week to receive, review and certify the loan documents for Settlement. If there is an error with the execution of these documents then your Lender may require you to resign which will further delay their readiness for Settlement. By this stage you should have also received documents from your Lawyer which you will need to complete, sign and return. These include a questionnaire, searches check list and Office of State Revenue Transfer Duty forms if applicable. Again, you should attend to this as soon as possible after receiving them. If you are only borrowing part of the Purchase Price and are providing the shortfall funds to complete the purchase then you should make sure that these are available in your Lender’s nominated account prior to the Settlement Date. If your Lender is unable to nominate a ‘shortfall’ account then you should transfer these funds to your Solicitor’s Trust Account prior to the Settlement Date. You should also arrange for the power & gas to be switched on or transferred to your name. If you do not attend to this then you may spend the first weekend at your new home in the dark! Once your purchase is unconditional you should start packing and if applicable book a removalist. When booking the removalist please note that most settlements will occur between 2:00 pm and 4:00 pm in the afternoon. No one likes paying for a removalist to wait out the front of your new home while the Lawyers are finalising Settlement.Before Settlement we also recommend that you carry out a pre-settlement inspection, preferably on the day before or morning of settlement to ensure that no fixtures have been removed and that there are no other anticipated issues with the Seller providing vacant possession i.e. you want to make sure that if they haven’t already moved out that they are n the process of doing so and will be out before Settlement. Once Settlement is completed you will be notified by your Lawyer at which time you can collect the keys and start moving in! The above is general advice and if you are looking at purchasing and have questions in relation to the conveyancing process please do not hesitate to contact our office to discuss your matter further.